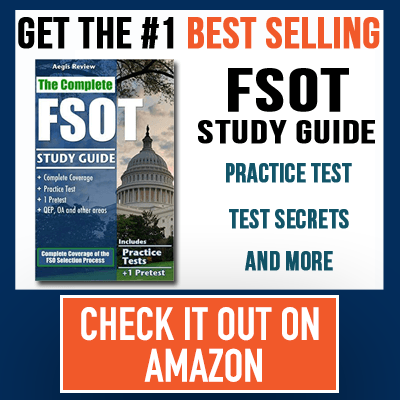 The FSOT exam is a computerized exam that will test the multiple different facets of your knowledge that the State Department believes is critical to being a successful Foreign Service Officer. To help you prepare for the Foreign Service Officer Test, we’ll go through each section and discuss what you can expect from each and how you can prepare for them prior to taking the official FSOT. This is not something that you can just pick up a book and master in a couple of hours. This is usually an amalgamation of years of experience or thousands of hours in extra education. If you aren’t already up to that level, then you need to start and start immediately. Just remember, the preparing for the FSOT is more like a marathon and less like a sprint. Looking at the subjects and previous questions, Job Knowledge section of the FSOT is like Jeopardy. It asks random questions and based on your experience, you’ll either get it, or you won’t. The frustrating thing about this though is that each time you take the FSOT – or play Jeopardy – you’ll have different results. Ever see someone on Jeopardy rock it and then in the next episode take 3rd place? Welcome to the job knowledge section. So as to get a good jump on it, I highly recommend you take the free practice test and check out a professional study guide. Both will be critical in your self-assessment as well as your studying. The English Expressions section of the FSOT is focused on ACT and SAT level English questions. They’ll provide a couple of paragraphs and mark certain parts for you to decide what would be the proper grammar. Basically, you need to be advanced in your grammar and its proper usage. They are going to test you on random rules and nothing will be obvious. If it were obvious, every English speaker would nail this part. But alas, it never is. To prepare for this section, you need to get familiar with the rules AND their proper use. For this second part, you can’t just get a normal grammar book and slog through it. Instead, I recommend getting a grammar book that creates ingenious ways of remembering rules and gives enough practicality that during a highly important and time-critical exam, you are able to work on the fly. My personal favorite is the Grammar Girl books by Flaherty Mignon. Combine this will a daily listen to her podcast, and you will quickly become a Grammar Nazi in no time. Biographical Information is just that…information about you. Now, most would recommend that you write something grand and incredible so that you stick out. BUT be careful about doing this. Your Biographical Information supplied in this section can and will be used against you in your Oral Assessment (OA). So, don’t go overboard and not be able to back it up. Also, one design inside of this is to get you to contradict yourself by answering questions one way and later on being asked that same question but in another round-about way and see if your answers vary. Be on your guard in this section. I personally don’t think it has as much weight as the other sections do, but it’s a lot more tricky than people think. Once you have completed this section of the test, 2 Pearson Vue testers will check your responses. At this point, you are now complete. Now, go get a stiff drink and await the news. Just wanted to let you know that the format of the test has supposedly changed and section three is now Situational Judgement Test instead of Biographical.